UFC middleweight Mark Munoz (Pictured) didn’t have his A-game against Chris Weidman last Wednesday at “UFC on FUEL TV 4,” and Weidman made “The Filipino Wrecking Machine” pay for it – as depicted by the photo above. 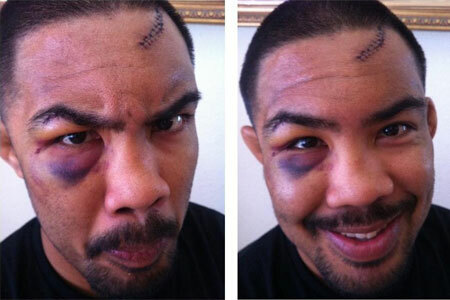 Although Munoz suffered his first defeat since dropping a split decision to former top contender Yushin Okami in August 2010, MMA’s Mr. Nice Guy was still flashing his trademark Kool-Aid smile despite donning a battered mug and a new blemish on his résumé. In addition to his 2ndRound KO loss to Weidman, Munoz also left HP Pavilion in San Jose, California with several stitches on his forehead and a black right eye. “Lucky I have a hard head. Can’t wait til I’m totally healed,” Munoz wrote on his official website accompanied with the above picture. Munoz had rattled off four straight victories prior to last week’s outing. The scrap marked the 34-year-old’s first tango since undergoing elbow surgery in January.